Well, apparently the problem isn’t solved. The debate continues, and there’s been a spate of new books recently addressing the issues of Genesis, science, creation and evolution. John Walton, The Lost World of Genesis One: Ancient Cosmology and the Origins Debate (IVP, 2009). Richard Carlson and Tremper Longman III, Science, Creation and the Bible: Reconciling Rival Theories of Origins (IVP, 2010). C. John Collins, Did Adam and Eve Really Exist? : Who They Were and Why You Should Care (Crossway, 2011). 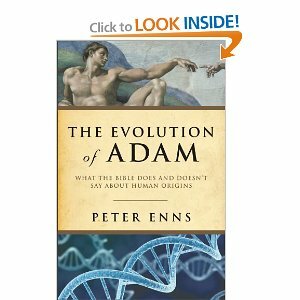 Into this mix, Peter Enns (recently hired by Eastern College to each Old Testament) adds his own contribution, cleverly titled, The Evolution of Adam: What the Bible Does and Doesn’t Say about Human Origins (Brazos, 2012). 1) Accept evolution and reject Christianity. 2) Accept Paul’s view of Adam as binding and reject evolution. 3) Reconcile evolution and Christianity by positing a first human pair at some point in the evolutionary process. 4) Rethink Genesis and Paul. (I suspect this is going to be the option he’s going to choose). Enns thinks most Christians who, like me, don’t see a direct conflict follow some variation of option #3. He then informs us that his book will be divided in half. Part 1 looking at Genesis, and Part 2 looking at Paul. While I will wait to access Enn’s overall theory (I plan to have 2 more blogs on Enns), I’m attracted to his approach of taking Paul more seriously than most of us OT types typically do. I have one preliminary question, How distinct will Enn’s perspective (#4) be from option #3)? I really want to read this book. I have heard a lot of good things about it. Also, your wife is a great manuscript leader. I taught her everything she knows. Actually, it’s probably more the other way around. I’m glad you’re enjoying it. Make sure you introduce yourself to Shannon. Dr Lamb, I have been thinking a lot about this lately. I have no problem with Option 3 and its variations, and I suspect that I don’t have problem with Option 4, given Dr Enns’ respected scholarship. But I hope you don’t mind me asking a dumb question: Why do we have to reconcile evolution and Genesis 1-3? That is, should we attempt that at all? There are tensions and contradictions between “modern” science and “ancient” sacred texts. The two exist for different reasons in very different contexts. If we try to reconcile them, aren’t we bound to twist the meaning of the text? I am not saying that we should ignore the apparent contradictions between evolution and the Bible, as if they don’t exist. But I wonder whether “reconciling” the two is the best way forward? Or have I missed something obvious here? I am intrigued by your comments that you don’t see any conflict between Genesis and evolution. I know that before we could have any kind of discussion about how the two could be reconciled I would have to know what you understand Genesis 1-2 to be teaching and what you believe about evolution. I am not asking you to go into a detailed description of either, but I just do not see how you could possibly see points of conflict. I suppose that my comments are a reflection of my view of what Genesis 1-2 teaches and what I understand evolution to presuppose (naturalism).